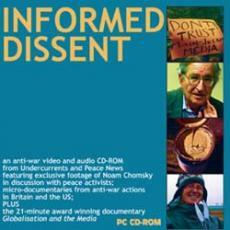 Anti-war video CD-ROM from Undercurrents and Peace News. Featuring exclusive footage of Noam Chomsky in discussion with peace activists on topics such as: 9/11; Iran; Iraq; Afghanistan; oil; terrorism. Plus micro-documentaries on recent British and US anti-war actions and the award winning documentary Globalisation and the Media. System requirements: P200 (P500); 64MB (128MB) RAM; sound card; web browser; media player. The best media player for this disc is MS Windows Media Player; older copies of RealPlayer and QuickTime do not play MPG1 format very well. This disc is optimised for PCs, but will work in Macs using QuickTime. Get 2 copies for £10. Price includes UK p+p. Add £3.50 for international shipping.